Protein blend (Whey Protein Concentrate, Whey Protein Isolate, Egg Albumin, Calcium Caseinate, Whey Hydrolysate), Carb Blend (Waxy Maize Starch, Maltodextrin, Levulose, Inulin), Fat Blend (MCT, Flax Oil Powder, CLA, Soy Lecithin), L-Glutamine, Cocoa, Tricalcium Phosphate, Natural & Artificial Flavours, Bromelain. A rich, medium thickness, weight gain shake. High protein levels with carbohydrates and significant levels of MCT oils. One of the highest quality weight gainers on the market that is storming in popularity and gaining a reputation fast for its quality. 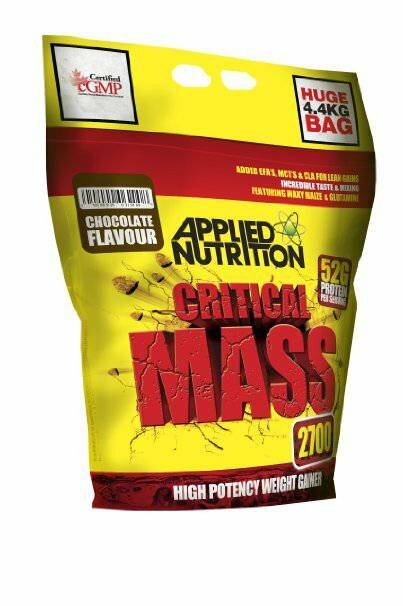 Using ultra high quality sources of carbohydrates, proteins and fats, critical mass has only the richest sources of all macronutrients designed to work synergistically for the most potent and effective results possible. Each serving provides a muscle hypertrophy inducing 52g of various sources of protein. This protein matrix includes the incredibly fast acting whey protein hydrolystate for a fast recovery rate but also time release egg albumin as well as calcium caseinate allowing amino acids to steadily enter the bloodstream ensuring positive nitrogen balance as well as a constant flow of anabolic amino acids. Alongside the high quality proteins is a blend of healthy fats designed to ensure optimal hormone production for muscle growth. In addition to this EFA, CLA, flax seed and MCT's also improve aesthetic appearance by assisting maintaining a low body fat, so despite providing over 900kcal per shake you can have peace of mind that this is one weight gainer that won't simply make you fat. The carbohydrates used in Critical Mass 2700 are also a mix of fast acting (high GI) and slow releasing (low GI) carbohydrates. This ensures that post workout carbohydrates such as waxy maize starch shuttles all important amino acid, protein fractions and other nitrogen containing compounds such as creatine into muscle cells efficiently, as well as restoring glycogen levels. This gives your muscle bellies a sense of fullness leaving you feeling pumped even after training as well as making sure no micronutrients are ineffectively wasted. Critical Mass 2700 is truly a unique weight gainer ideal for any athlete seeking to positively improve muscle mass and strength. It is a great addition to any athlete who is involved in high energy sports such as rugby, wrestling or simply has a fast metabolic rate. Without a doubt this ever popular weight gainer delivers promising lean gains in an enjoyable delicious shake.